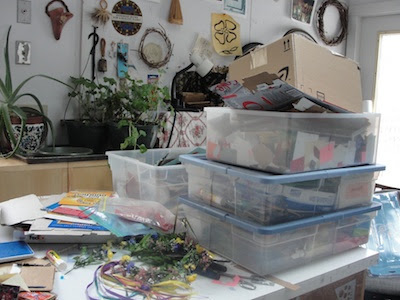 Here's the studio table the day after my book project at the craft table at the Revels Spring Sing in Watertown. Yesterday was great fun making books with the kids while listening to all the voices joined together to welcome in the spring. Tony Barrand, a longtime favorite of mine, was the guest artist. Now to put everything back in its place.